People talk about Marine Drive and Jogger’s Park, but seldom do you find someone from Mumbai enjoying the tranquility of Worli Sea Face. The stretch that leads to Worli-Bandra Sea Link, and even goes onward to Worli Koliwada, has some interesting things to do and see. Here are some fun yet brilliant things you can do when you visit. The sea face has an open gym and frequently has people pumping up some iron and enjoying the spectacular view on offer. Apart from this, you also see morning and evening joggers and walkers who make it a point to complete the entire 9-km stretch and then sit down and enjoy the view. Sometimes, if you’re lucky, you may just spot a celeb in the latest athleisure gear, running to and fro. But yeah, don’t get your hopes up too high; it’s just pure luck. 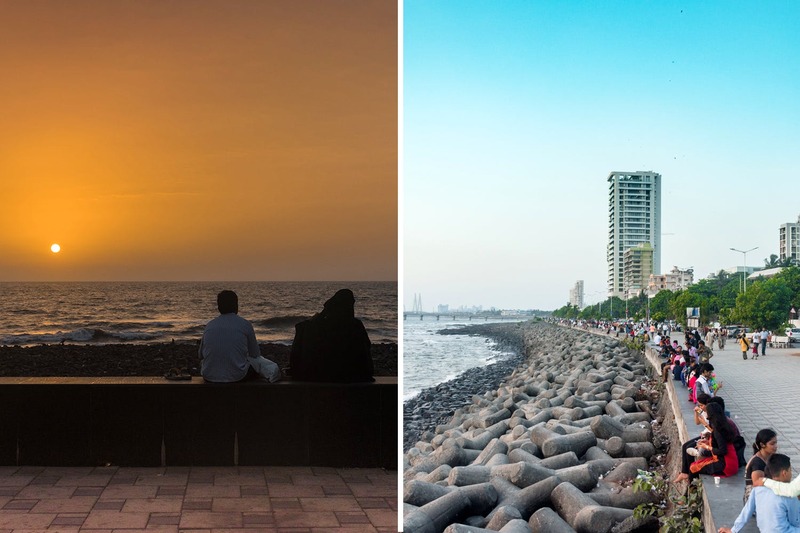 There are two spots at Worli Sea Face that will assure you plenty of likes on Instagram. First, the statue of RK Laxman’s The Common Man that stares into the sunset. Take a picture with the Common Man or compose a frame that will assure your photographic journey into the world of Insta likes. The second spot, of course, is the spot that is the beginning of the Sea Link. Compose a frame that shows the girders of the bridge, that have now replaced The Queen’s Necklace as the next big thing to shoot in the city. If there is a promenade, there is bound to be roadside food. And while it may come in the way of your walk or run, it’s a good place to enjoy some paani puri or chaat. Or else, if you continue to stay healthy you can go across the road and visit the Aarey booth outside the milk co-operative’s unit in the area or even the Mafco booth that serves heavenly sandwiches, frankies, burgers and even soft drinks and juices (INR 200 for two).